This is a classic pub, full of footy memorabilia, and boasting two beer gardens – one in the back and one down the side. It caters to a business crowd during the day, and features a TAB, which doesn't overwhelm or dominate the venue. 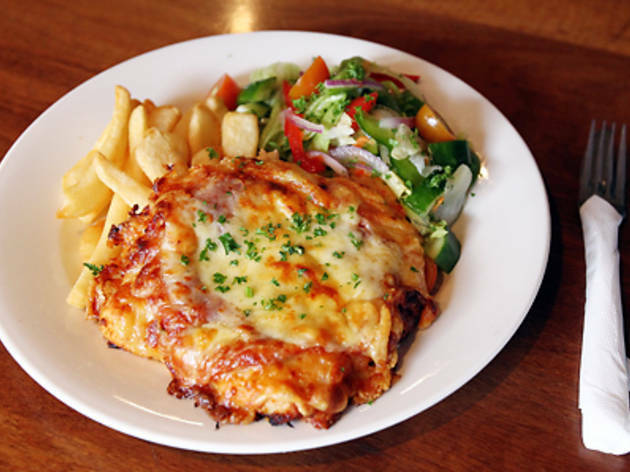 The classic No 1 parma (something of a legend around these parts) costs $18, leaving you a few coins for the in-house TAB or half way to pot of beer. 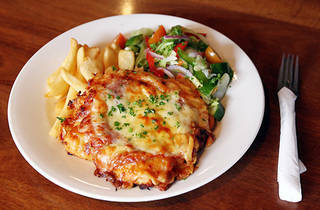 The bolognaise parma comes in at a clean $20, helping you avoid the difficult choice of what to do with your remaining change. The parma is smaller in width and length than most, but it's remarkably thick. Less of a pancake and more like a massive steak with a good range of nine beers on tap to wash it down.